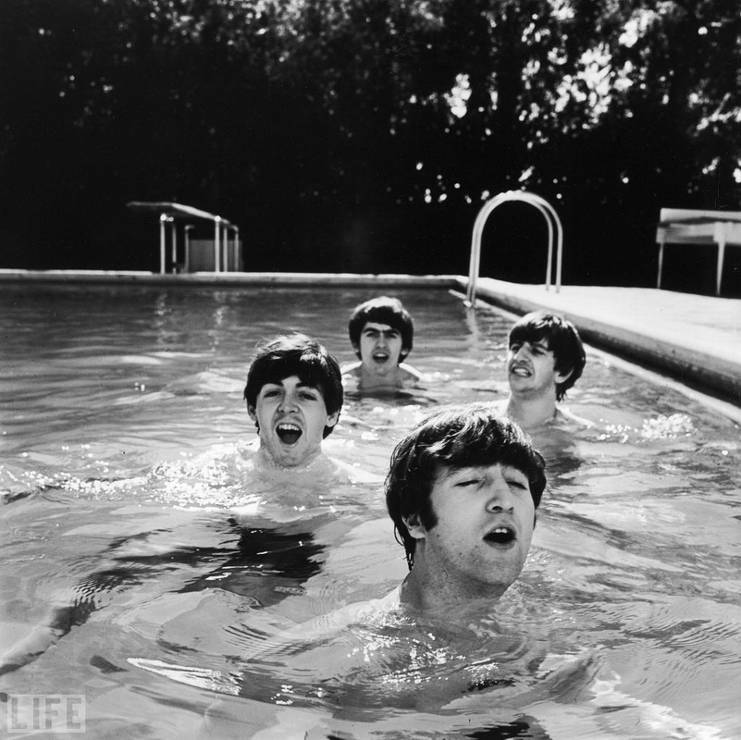 In John Loengard's popular photo of John, Paul, George, and Ringo, taken during their first trip to America, the lads' famous mop tops bob undisturbed above the water's surface. The pool was quite chilly that day, thanks to a cold snap -- check out Ringo's grimace -- and Loengard has said the Beatles even began to turn blue; still, in the short minutes he had to get this shot, the photographer cleverly asked the boys to sing, and thus managed to draw out the playfulness and passion that made them so beloved. In faimoasa fotografie realizata de John Loengard celor 4 baieti de la Beatles: John, Paul, George si Ringo, poza capturata in timpul calatoriei lor in America, baietii au fost fotografiati in timp ce isi plimbau netulburati tunsorile inconfundabile la suprafata apei. Apa din piscina era destul de rece in acea zi, datorita unui val de frig - a se vedea grimasa lui Ringo - si Loengard a spus ca cei de la Beatles au inceput sa devina vinetii; insa, in putinele minute pe care le-a avut pentru a face aceasta fotografie, istetul fotograf i-a rugat pe baieti sa cante si astfel a reusit sa scoata la iveala aerul lor jucaus si pasiunea caracteristica care i-a facut asa de iubiti.